Background: During our plane ride to Orlando, Emily asked me to figure out how many times we have each been to Disney World. (NOTE: If I were a suspicious person, I would think that her father had put her up to it as perhaps an attempt at intervention??? ) I was a little surprised (but not at all regretful) when my final trip tally came to 17 (counting this one) and the girls weren’t too far behind me. 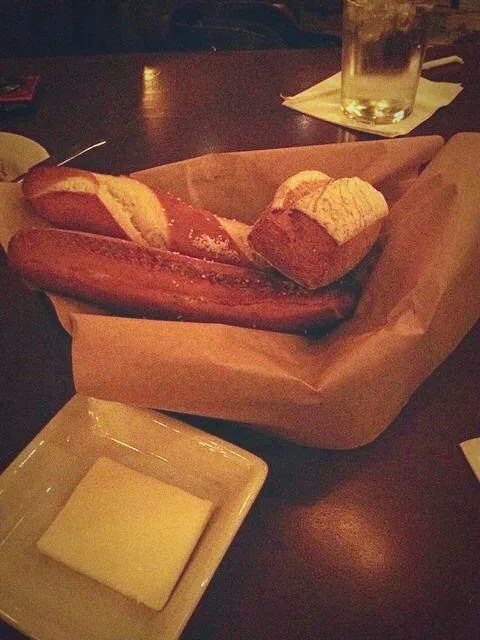 So how does this relate to Le Cellier? 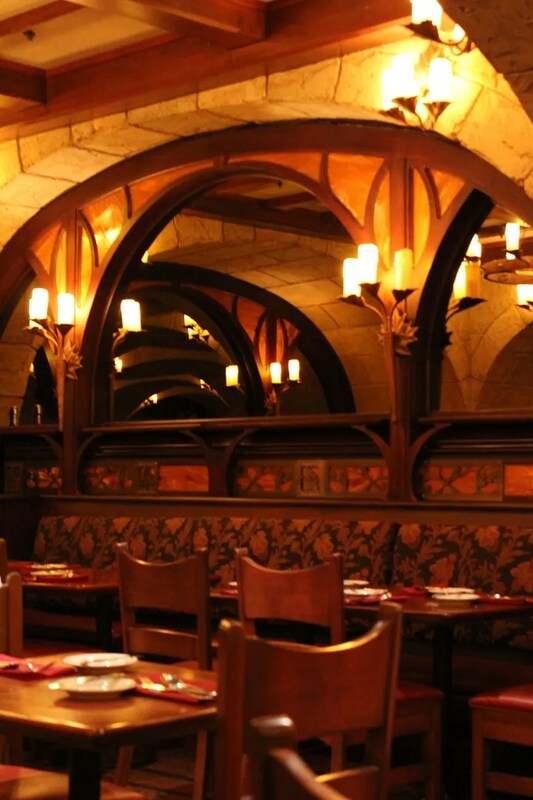 Well, of my 17 trips to the World, I have dined at Le Cellier during nearly all of them. So needless to say, this restaurant seems to be a family favorite (or perhaps habit? ). Now I wasn’t always certain why it was a favorite, since we have had some experiences where we had mediocre food (well, really just the steaks) or bad service. Actually once we had both. 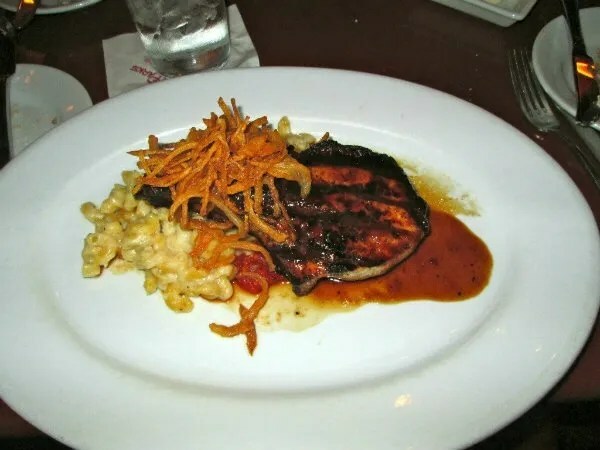 But then a couple of years ago, we finally learned to resist the urge to order steak (which we found to sometimes be good and other times not) at Le Cellier Steakhouse and started trying other non-steak entrees on their menu. Since that time we have found the food to be consistently very good. 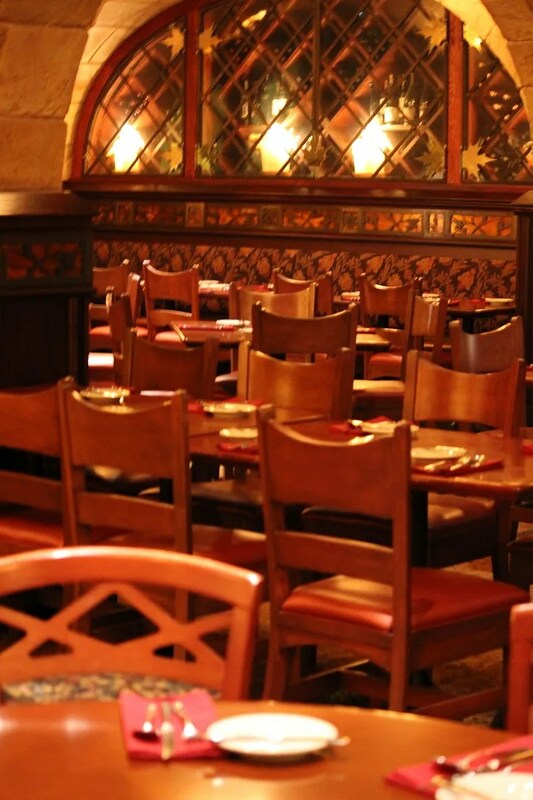 With that in mind, we were all looking forward to our lunch at Le Cellier. 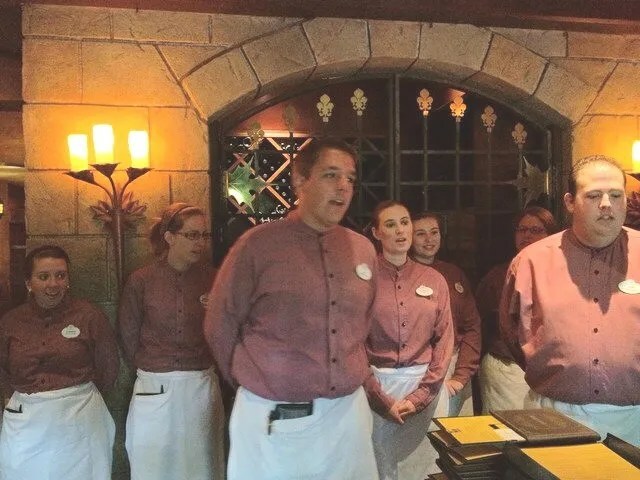 Despite our numerous visits to Le Cellier, I had never before been able to get an reservation at opening time of the restaurant so had therefore never seen this. Although they were no Voices of Liberty, those of us in the lobby who saw them perform were appreciative of the gesture. 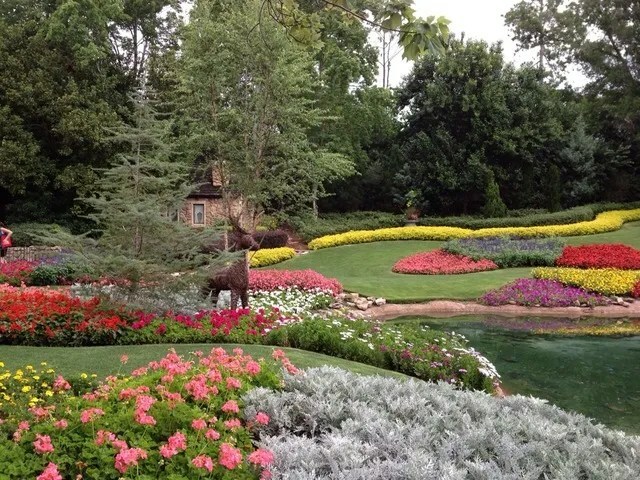 Oh, and I should apologize for the quality of the picture, but Emily was outside with her camera taking pictures of the Victoria Gardens, which were looking especially beautiful for the Flower & Garden Festival. Consequently, I was forced to take the picture of the singers with my phone. something you don’t often see. neither of which I can remember because we were concentrating so hard on all the menus we were given. The alcoholic beverage menu (which we decided against ordering from), the regular lunch menu, and the Prix Fixe lunch menu. And speaking of menus, here is a pic I took of their current Lunch menu posted outside of the restaurant. This was actually Emily’s bowl of soup, as she ordered her lunch from the Prix Fixe menu so received the larger portion. Allison and I each had a cup. 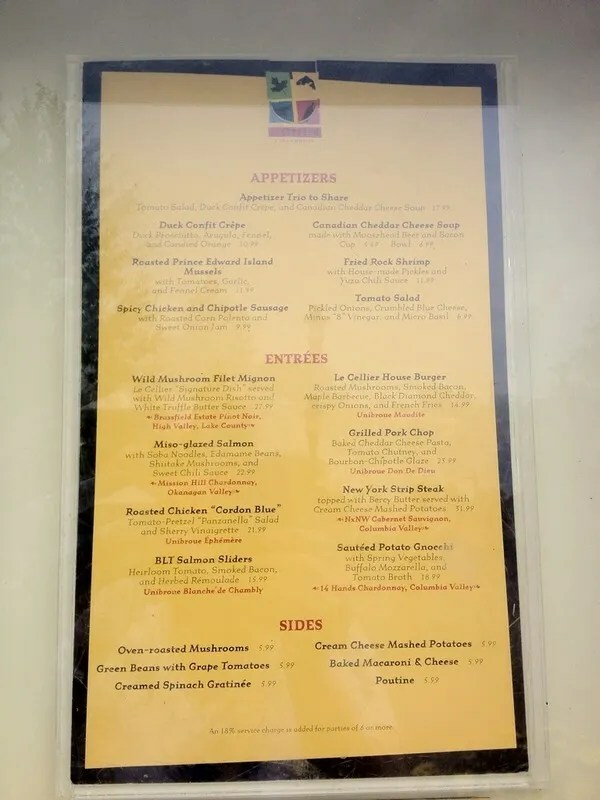 Now I must admit that the first time I tried Le Cellier’s cheddar cheese soup many years ago, I didn’t like it at all (thought it tasted too much like beer and I don’t like beer very much). Well, since that time I’ve grown to enjoy it very much and this time was no exception. I gave it a solid Very Good rating. However Allison has always loved it and again loved it this time, giving it an Excellent rating. So that left Emily with the deciding vote. After quickly devouring every last drop of her larger portion of soup, she very nonchalantly rated it only a Good. 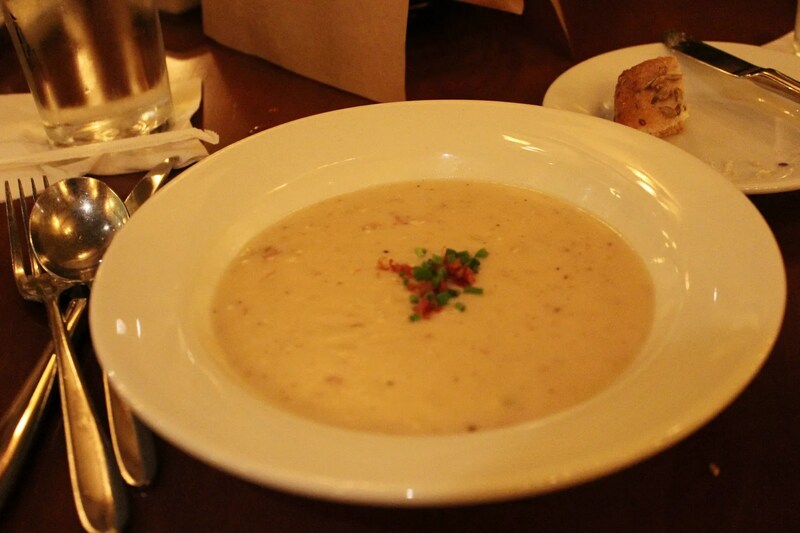 Hence, our average rating for the Canadian Cheddar Soup was a Peter Pan Very Good. She loved the pork chop and gave it an “Excellent” rating, however Allison also ordered the Pork Chop and gave it only a “Good” rating. I should tell you though that Allison’s lower rating may have been influenced by something that had nothing to do with the Pork Chop. 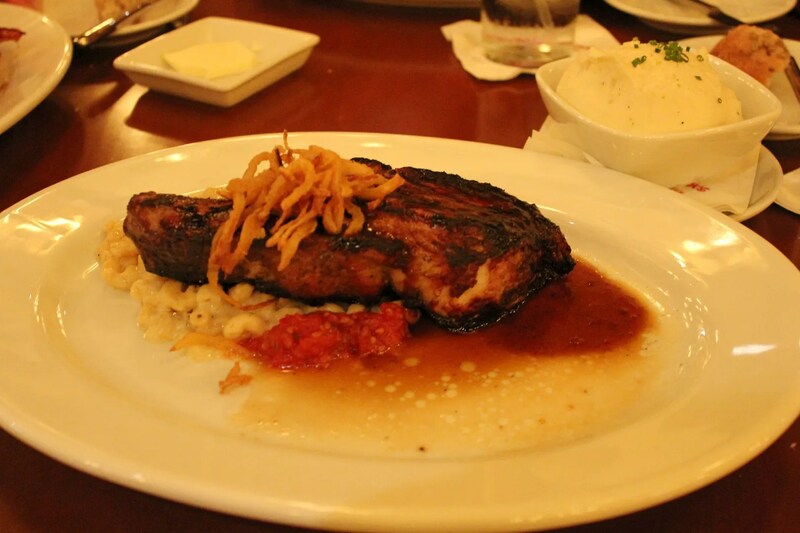 On her last visit to Le Cellier in May 2011 she had the Walnut-Crusted Salmon and absolutely loved it. Sadly, though they still offer salmon on their lunch menu, Le Cellier has changed the preparation a few times in the last year (it was Maple-glazed in Nov.) and currently offers a Miso-Glazed Salmon. She was not sure that she would like this version, so decided to go with the Pork Chop. I think though that her disappointment may have caused her to be more critical than usual. In other words, I doubt that she would have given any other entree a higher rating than “Good”. Oh, and by the way, neither of them cared for the macaroni and cheese side dish. 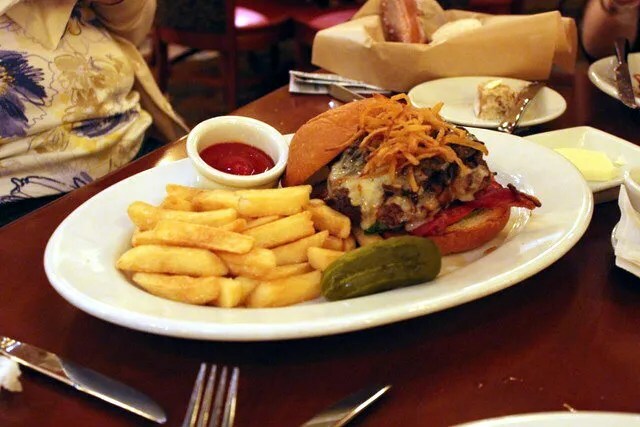 This is a really good burger! 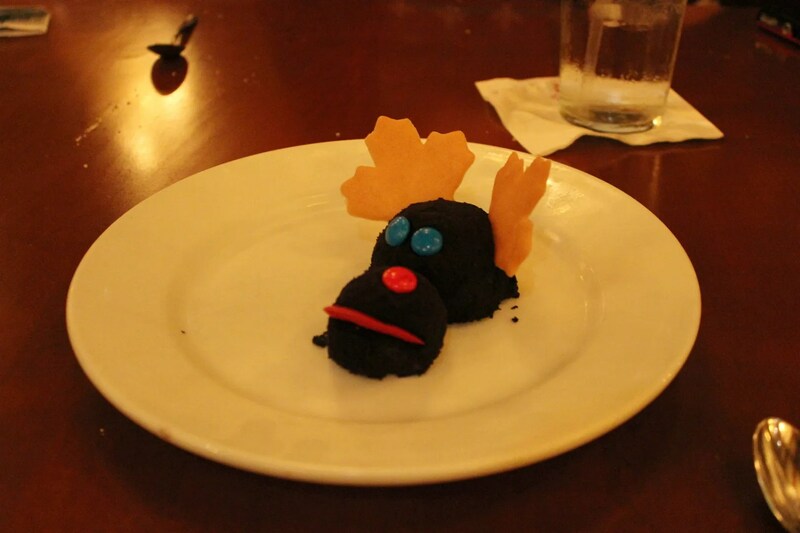 In fact I can’t think of a better one at Disney World, at least that I have encountered. Not only was the burger itself prepared to a perfect medium-well as ordered, but I really enjoyed the combination of all the toppings. I would again give this a solid “Very Good” rating. Oh, and the french fries were pretty good too, however they pale in comparison to the side dish that we ordered to share, the Cream Cheese Mashed Potatoes. 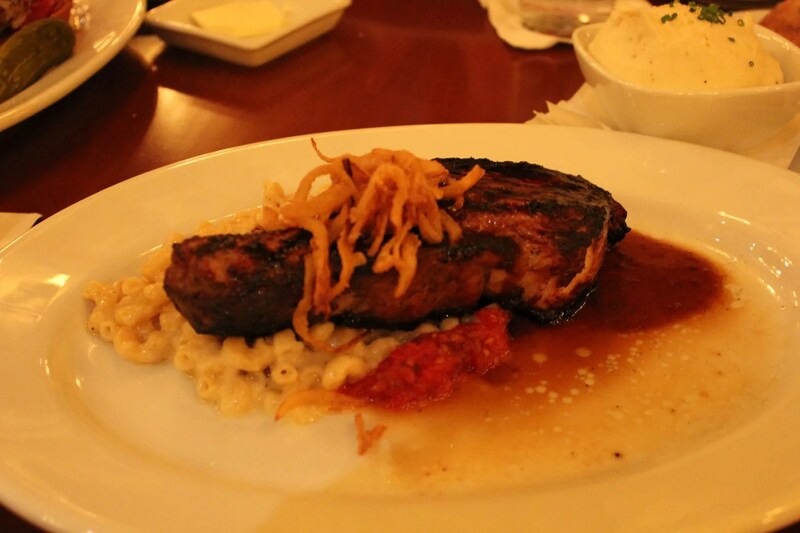 We didn’t take a separate picture of these, but you see them in the right-hand corner of this Pork Chop picture. The Creamed Cheese Mash Potatoes were something that we could all agree upon and it received a perfect score of three “Excellent” ratings. 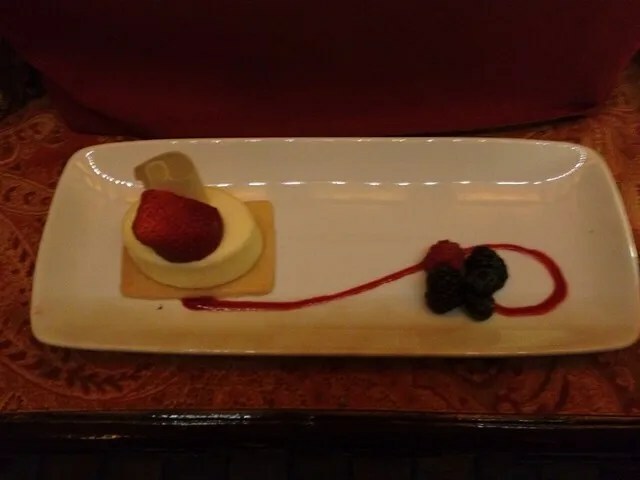 If you are mashed potato fans (like we all are) and haven’t tried these yet, do yourself a favor and order these the next time you are at Le Cellier. You can substitute them for whatever side normally comes with your entree or you can order them as an additional side dish like we did. She graciously offered to share her dessert with us, so DD1 and I each had a few bites. Our ratings for the mousse ranged from “Okay” to “Very Good” and seemed to be directly tied to how much the rater likes chocolate. 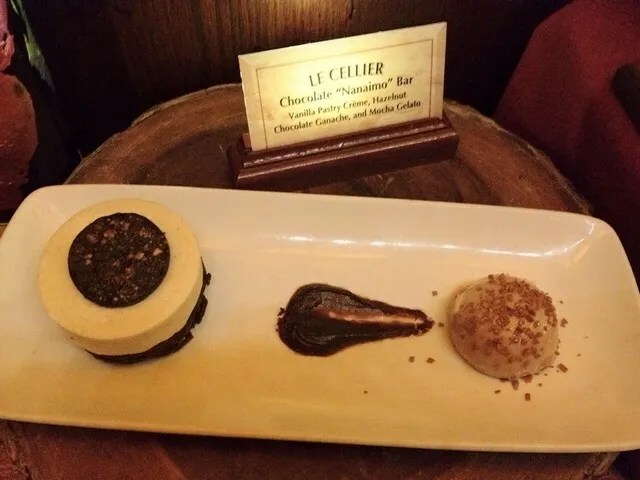 So although we only got to try one of Le Cellier’s desserts on this visit, on my way out I did take a few pics of some of their other offerings on display. 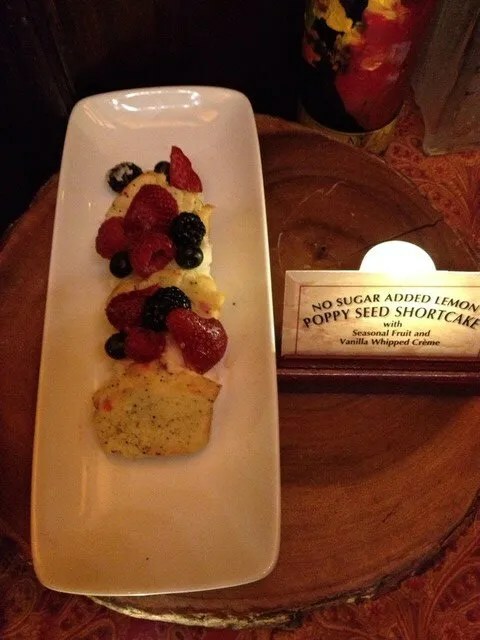 White Chocolate Cheesecake with Citrus Shortbread Cookie, Seasonal Berries and Raspberry Air. Wait, Raspberry Air??? What is that? So our overall rating for this meal was: Like Peter it was a star, and I’m sure will continue to play a starring role in all our future trips!